I bought this comic on impulse. 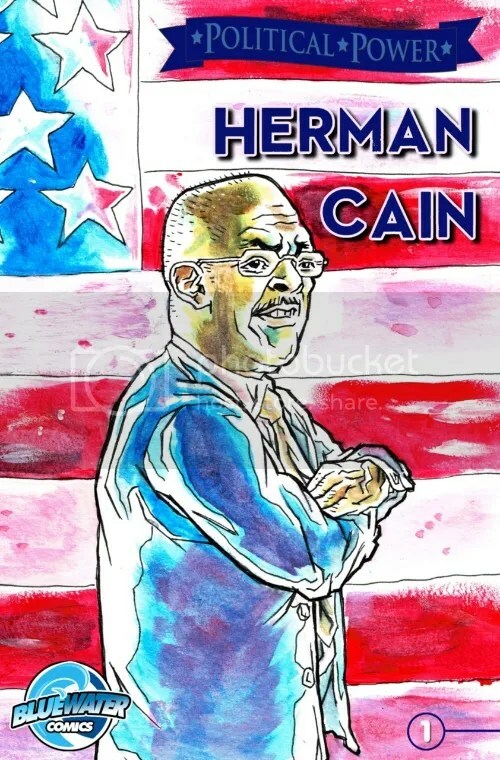 I don’t think much of Herman Cain, for reasons which I’ve written about before, and nothing has changed my mind about him since the last election. But there weren’t many new comics I was interested in last week and, well, this is a “Black comic-book”, right? And I did get the two comics about Barack Obama that Bluewater Comics published back in 2008, and they were well-done, so I figured maybe this would be interesting too. Well, it’s written by Jim Beard, and he writes the story as if it’s being narrated by two friends having a conversation. We see their comments in captions, as one person tells the other about the life story of Herman Cain, with the other unseen narrator interjected now and then to ask questions. From there it’s a pretty straight-forward biography, we learn how Herman’s parents met, and Herman’s father is credited with being the one who instilled within Herman the values of hard work and education. We learn that Herman ran for Class President in 7th grade & lost, but then ran Senior President in High School and won. He graduated from Morehouse and went to work for Coca Cola, got married, then went to work for Pillsbury, where he become a manager of a Burger King franchise. His success there lead to Pillsbury giving him the task of turning around Godfather’s Pizza, which was on the road to bankruptcy. Herman made it profitable again, then eventually bought out the company himself. He continued to rise in various businesses, before becoming an economic adviser to Senator Bob Dole, which is what lead to Herman’s forays into politics. He tried to run for the Senate in 2004, but came in 2nd in the primaries, had a bout with cancer in 2006 which he survived against heavy odd, and then we get to the 2012 race, which Cain entered after rising to prominence within the Tea Party Movement. Beard does a pretty good job of remaining non-partisan in his characterizations of Cain, and Cain’s run for President. He covers the various allegations of sexual harassment that derailed Cain’s campaign, but makes no judgment about whether it was true or false, just that Cain was unable to recover from the onslaught of bad press and was forced to drop out, despite continuing to proclaim his innocence. He ends by showing how Cain continues to remain active as a political commentator. No, this comic won’t change anyone’s mind about Cain, good or bad, but I don’t think that’s what Beard was even trying to do. He’s just presenting the facts, and I think anyone interested in politics could appreciate this. So the writing gets FIVE STARS. But this isn’t a prose book, it’s a comic-book. Which means that a lot depends on the art, which I have to say is TERRIBLE. I could tell when I saw the cover that it was bad, but I was hoping that the interior artwork would be better. It isn’t. Kurt Belcher is listed as Penciler and Robert Burns is the inker, with Ester Salguero as the colorist (and Darren G. Davis, the president of Bluewater Productions, as the letterer), and it’s just bad. Ugly faces, distorted anatomy, too dark in several places, and dull muted colors. I could barely give the artwork ONE STAR. It’s surprising because the art in the aforementioned Obama comics was fantastic. But this art team just doesn’t seem ready for published comics. I don’t like to speculate about rumors, but for the past few years I’ve read about allegations that Bluewater Comics doesn’t pay their artists, and perhaps that’s why they’re now in this position where they can only get less-experienced artists to draw their books? It’s a really a shame because I feel that Jim Beard’s script deserved much better than this. The book is only $1.99, another part of the reason I bought it, so it’s pretty cheap. If you’re a political junkie, I’d say go ahead and get this just for the writing, but beware of the art.